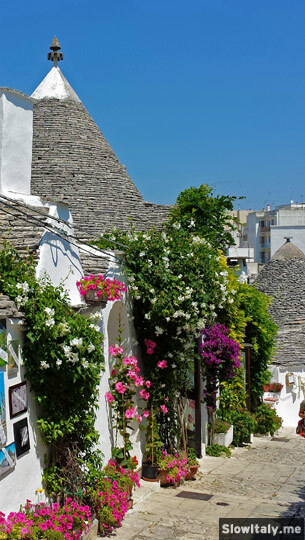 Alberobello, the capital of the trulli, is located at the edge of the beautiful Valle d’Itria, in the Puglia region of Italy, at the crossroad of the provinces of Bari, Brindisi and Taranto. 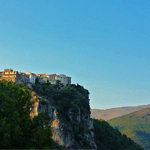 The town and surrounding countryside is characterized by its singular, whitewashed rural dwellings with conical roofs made of grey, flat, slate-like stones (chiancarelle). 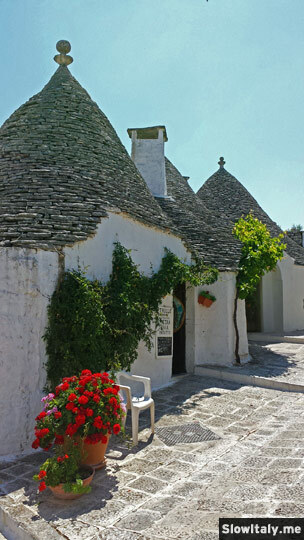 The technique used for building trulli is an extremely ancient one. 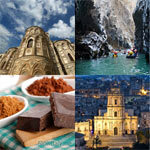 It was probably imported from the Middle East by the tribes that once settled in Puglia, which was the first territory they conquered in Italy. These tribes erected tombs to bury their dead and built hovels with pinnacles and symbolic signs that were common in their homeland. 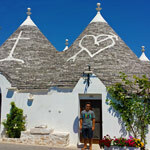 The word itself, trullo, derives from the Greek word tholos, meaning a circular dome-shaped construction. 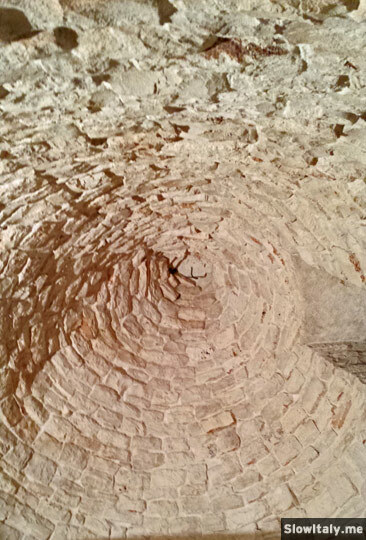 The conical domes, however, probably stem from Anatolia, where similar houses made of stones topped with a domed roof are known in Harran, an ancient city in Mesopotamia. 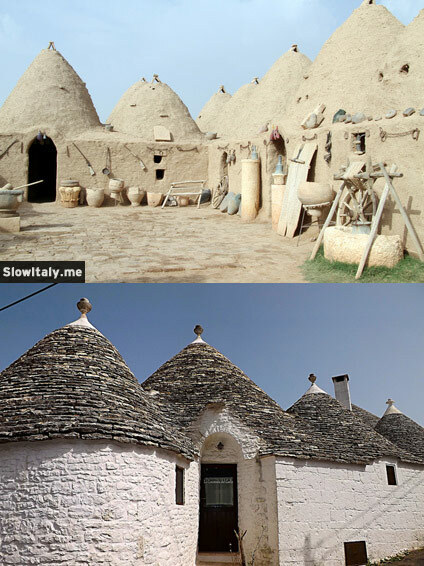 Harran (top) and Apulian (bottom) trulli. Photos © Valery Shanin (top) and Tarantino Vincenzo (bottom). 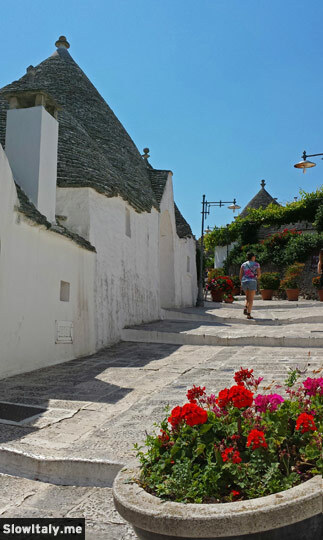 However, what makes the Apulian trulli so unique and stand out in the world is that, for a number of economic, social and cultural reasons, they have subsisted through the ages. 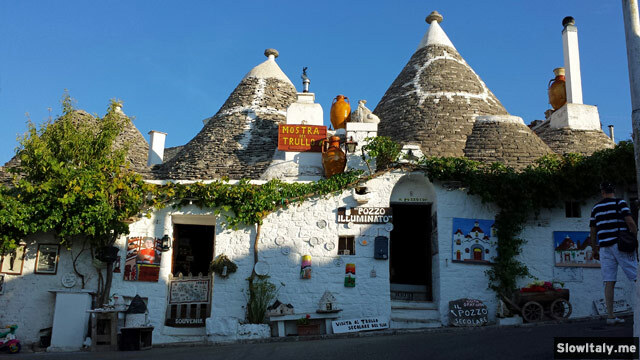 This explains why their architectural features have evolved over time and have become much more advanced than in any other type of trulli elsewhere in the world, while at the same time preserving the prehistorical building techniques that make them so incomparable. 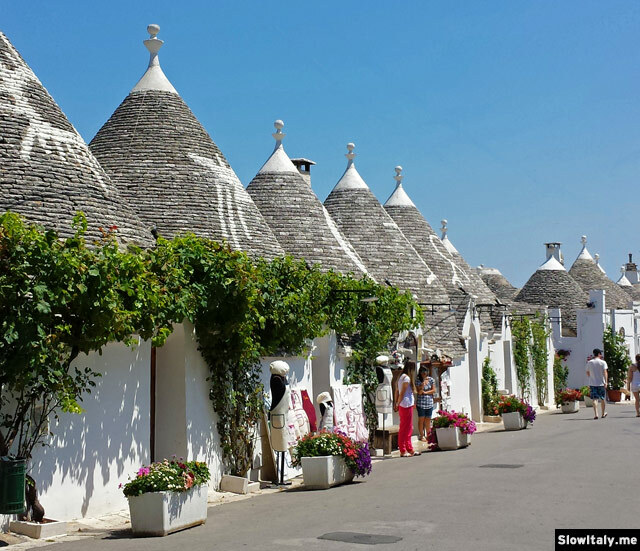 Indeed, this type of conical stone dwellings, which originally consisted only of the conical part built directly on the ground, have been continuously present and perfected over a millennium, or more, without being completely abandoned in favor of more modern forms of housing as in other parts of the world, reason why the historic center of Alberobello was added to the list of UNESCO world heritage sites in 1996. 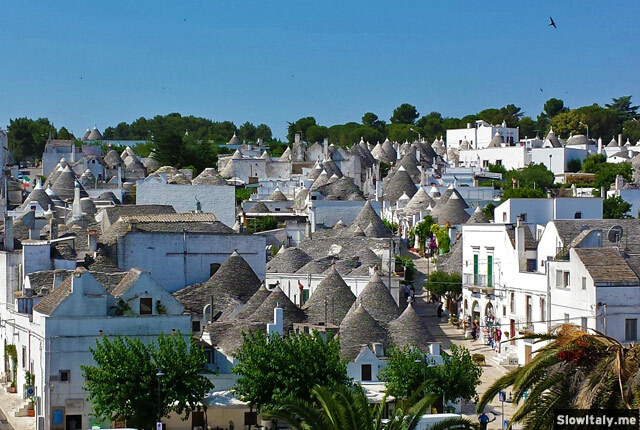 Why this type of dwellings is only concentrated in this specific part of Puglia can easily be explained by looking at the geological nature of the local soil. 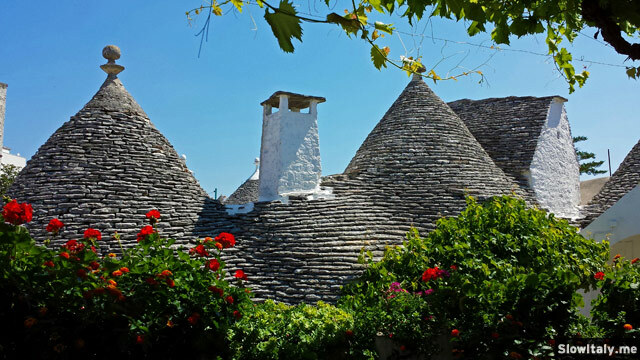 In the area of the trulli, the soil is made of laminated limestone, which offered an abundance of cheap building material (cheaper and easier even than cutting wood), whereas in the vast plain of the Foggia plateau and the clay soils of the Gulf of Taranto that was not the case. The technique used also made it possible for a single man to build his home, whereas the construction of wooden houses often required the cooperation of several persons. 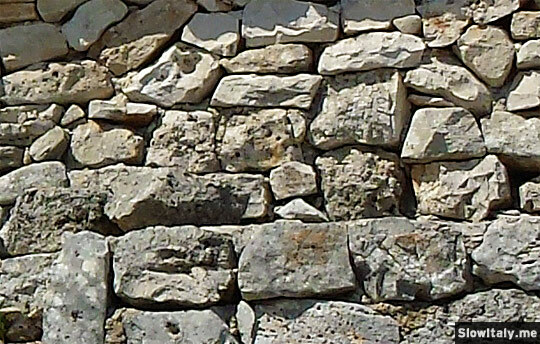 Detail of a trullo wall. 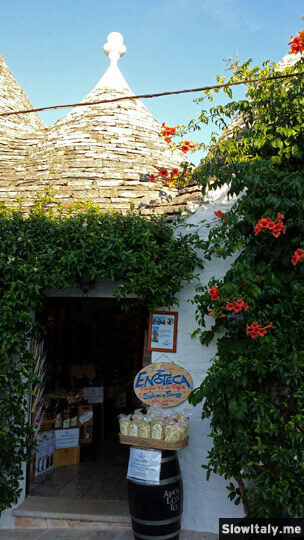 Another specific element of the trulli is that they are built “a secco”, meaning that they are dry stone (mortarless) constructions, made by astutely placing one stone over the other. The reason is that at the origin it was prohibited to build towns and villages without the approval of the King of Naples who ruled over that area. 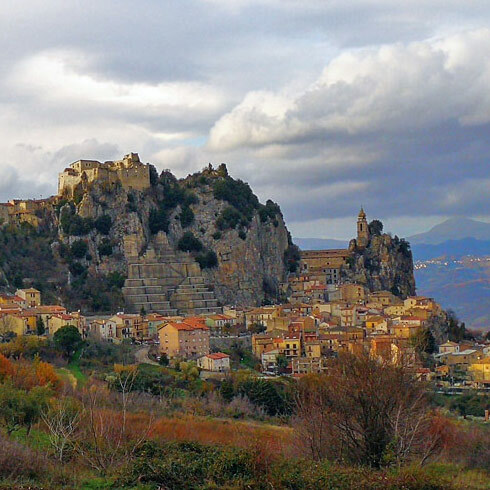 So, when the local landlord, GianGirolamo Acquaviva d’Aragona, attracted farmers to work on his land, he ordered the houses to be built in such a way that they could easily be dismantled overnight in case a royal inspection was announced. The technique also allows to easily remove a single stone of the roof, and adjust it or replace it, without having to dismantle larger parts of the cone, which would increase the risk of the dome collapsing. 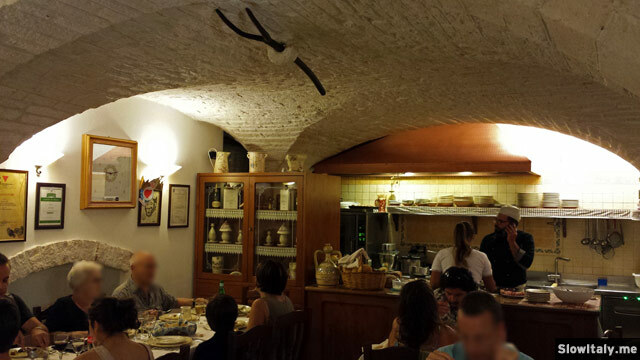 Trullo dome inside. Photo © Slow Italy. 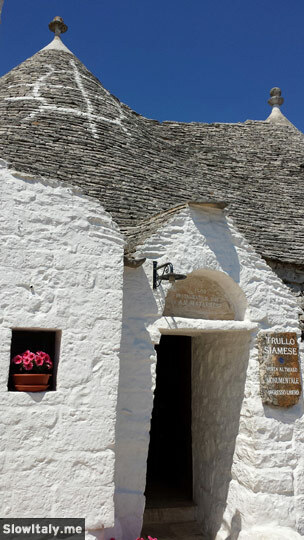 This explains also why the most ancient trullo “only” dates back to 1559, although their origin is much more ancient. As they could so easily be built and unbuilt, the building material of the older ones was often used to construct the newer ones over time, until they became more imposing and transmitted from generation to generation. 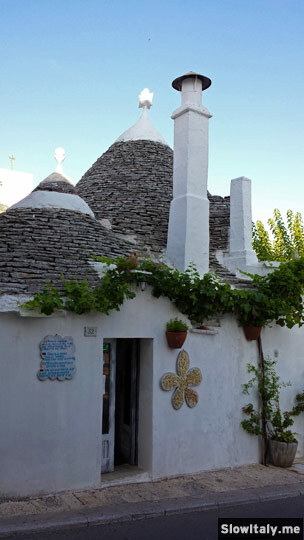 A trullo usually consists of two elements, a central square space, covered by a dome, the conical roof, and a second part being the additional rooms that are connected to the central room. The pinnacles, which can be of different shapes, and white symbolic signs painted on the roofs are also of very ancient origin. The most common pinnacles are round and linked to ancient sun cults. Others represent a pyramid or cone linked to sacred stone worship, probably of ancient middle eastern origin. Cross-shaped pinnacles are of Christian origin. 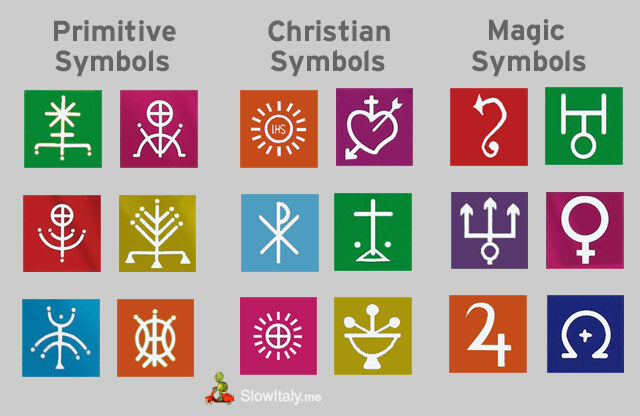 The symbols are of mixed origins and were believed to bring good fortune to the home or to keep demons away. 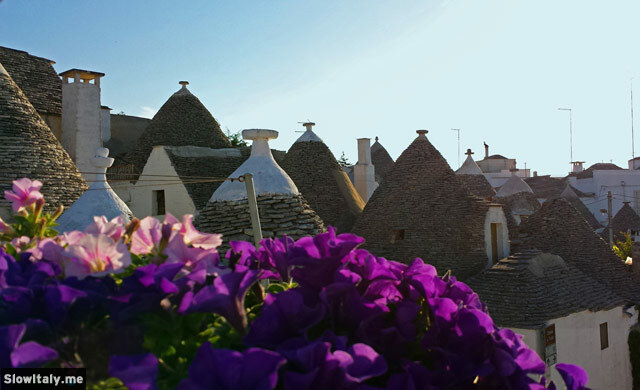 The various types of symbols found on the roofs of the trulli. 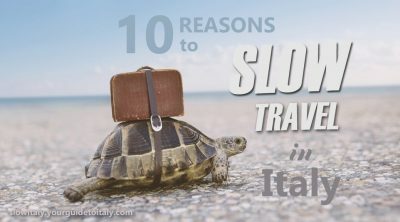 Infographic © Slow Italy. 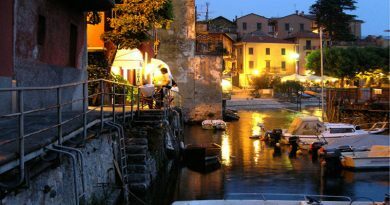 Today, the town counts about 11,000 inhabitants and ca. 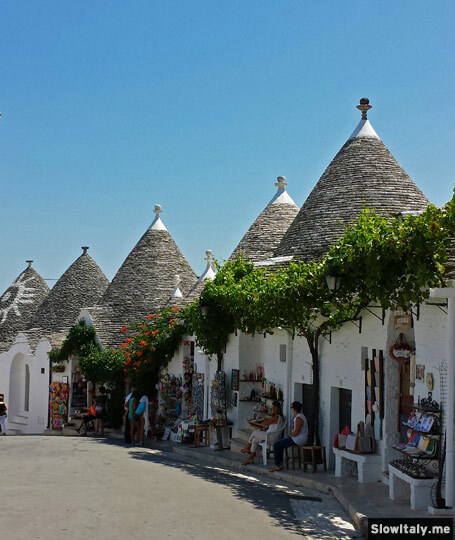 one thousand trulli-houses. 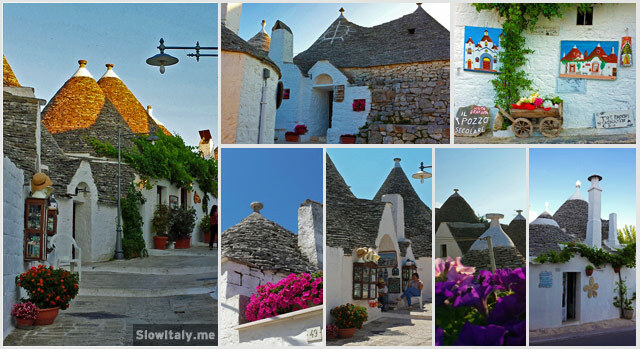 Each house can be made up of more than one trullo. 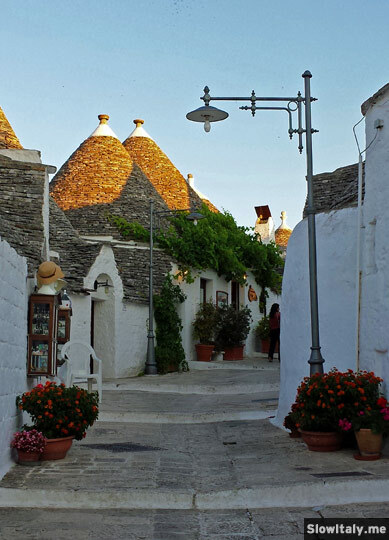 The Town of the Trulli is divided into six districts, along six parallel streets and two rioni, Rione Monti and Rione Aia Piccola. 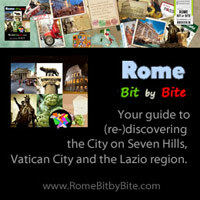 Rione Monti is the more touristy area with souvenir shops and restaurants and the characteristic Trullo Siamese, the Chiesa di San Antonio (1927) and other typical monuments (see further). 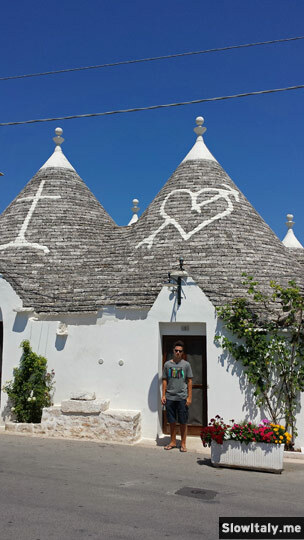 Trullo siamese. Photo © Slow Italy. 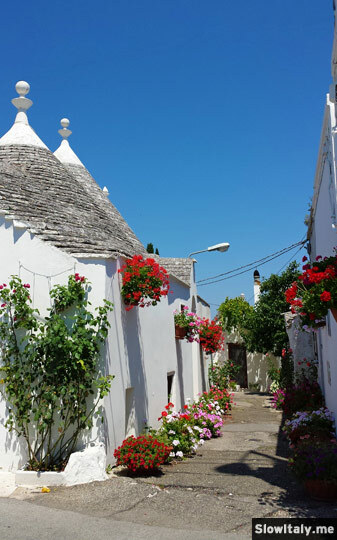 Rione Aia Piccola is the ancient part of the town, unaffected by touristy activities, where some of the inhabitants still live in trulli. 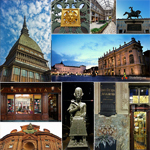 Here is also the Museo del Territorio. 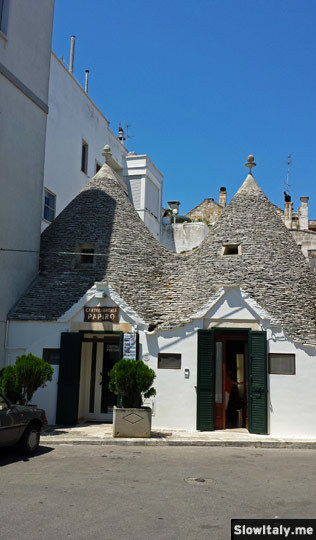 Private trullo-house in the Rione Aia Piccola. Photo © Slow Italy. Contrary to popular belief, the name of the town does not mean “beautiful tree”, but “war tree”. 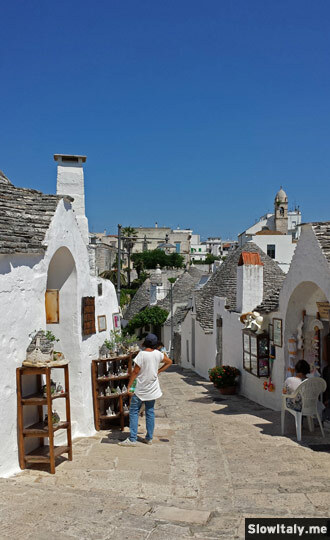 It stems from the Latin Sylva aut nemus arboris belli, literally “the forest of the war tree”, a term used to identify the place where Alberobello was located, either by defining the place itself or its borders, as in versus austrum per silvam Arboris belli. The place became known as the “Selva”, a forest where a unique, ancient oak tree grew, and where battles and armed attacks where common. 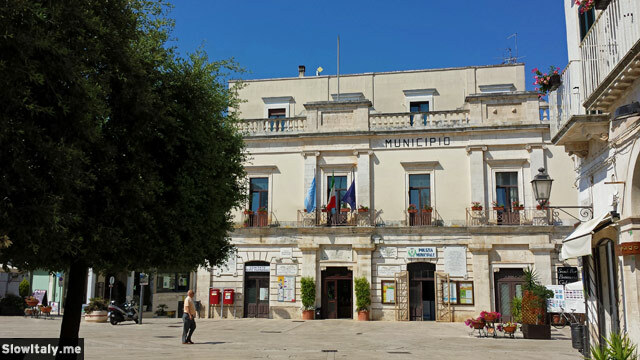 Piazza del Popolo. Photo © Slow Italy. 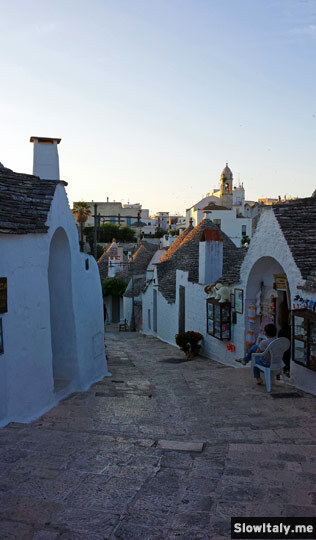 Recently, however, another explanation, which was already ruled out by the 19th century local historian Pietro Gioja, popped up again on the internet, linking the toponym to “Silva Alborelli”, which over time and through various transcriptions would supposedly have evolved into Alberobello. Even though both Arboris belli and Alborelli do appear in ancient administrative documents, the latter one is the least plausible as the origin of the name. 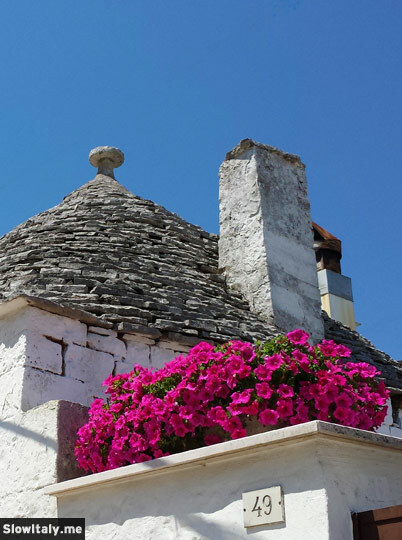 From a purely linguistic point of view, the evolution from arborelli or arborello into Alberobello seems highly improbable, especially when a much more straightforward etymology of Arboris belli is available. 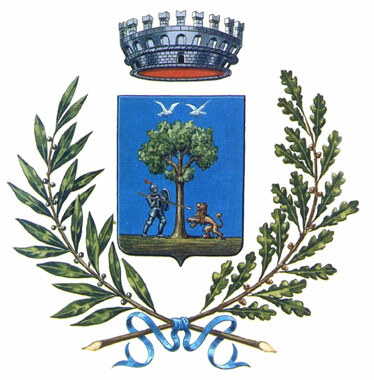 Moreover, the term “Silva Alborelli” refers to a collection of trees, a beautiful, well-stocked forest, more than a single tree, whereas the emblem of the city chosen in 1797 definitely shows a single, unique tree. The term wasn’t very specific either as it was used in more than one instance to designate other locations. It is, therefore, more likely that, during the first session of the town council in 1797, the original and very specific toponym of Arboris belli was chosen deliberately. Reversely, if the original name had meant “beautiful tree”, it would have been “arboris pulchri”, not “arboris belli”. 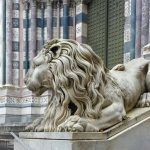 It seems highly unlikely that the original toponym would have included the Italian suffix “bello”, at a time when administrative and legal documents were written in Latin. Anyway, even if it were the case, the town would then have been called Arborebella, with a final “a”, as the latin arbor is a feminine word. The location of the famous oak tree is also a matter of conjecture. Most sources situate the oak tree, which was still standing in the 1830s, on Via Indipendenza (formerly Via Taranto), at the feet of Rione Monti, which makes sense as it is in between Rione Aia Picccola and Rione Monti. 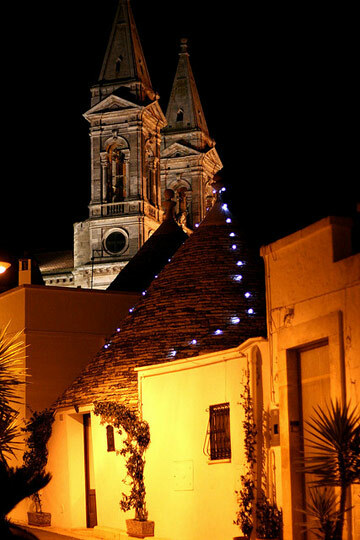 Trullo Sovrano: located outside the Rioni, to the north of the town, behind the Basilica dei Santi Medici. It is the only one in the world with 2 floors. 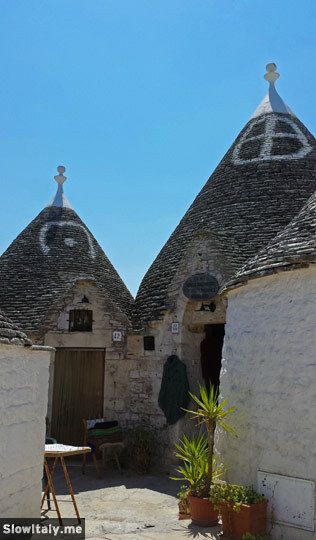 Siamese Trulli: the only twin trullo in the world. The story goes that it belonged to two brothers who were in love with the same woman. 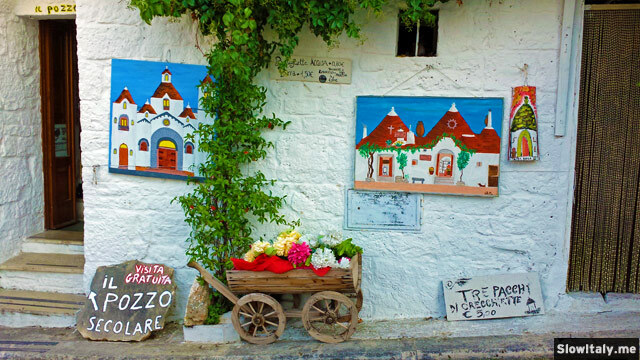 Due to the disagreement that followed due to them both loving the same woman, they decided to divide the trullo in two parts, with a main entrance on either side, on Via Monte Nero and Via Pasubio. The Basilica dei Santi. 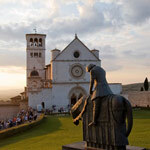 Medici, dedicated to the two patron saints of the town, Damian and Cosmas. The statues of the two saints are located inside the basillica. Basilica dei Santi Medici. Photo by von_boot. 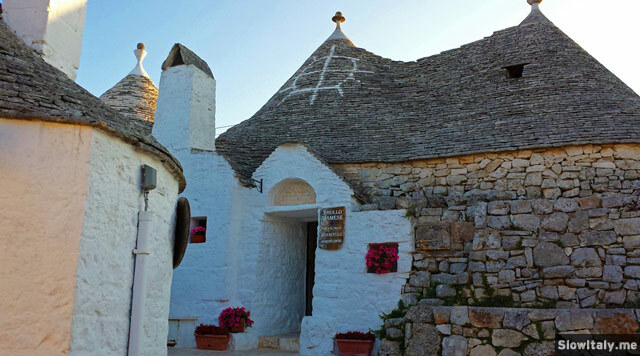 Case d’Amore: the first house built in brick and mortar in 1797 without the typical features of the trullo. 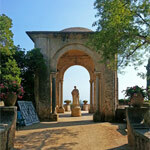 It is a symbol of the freedom from the feudal power granted to the town by King Ferdinando IV. 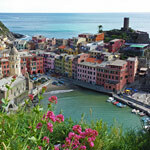 It belonged to Francesco d’Amore and is now the Tourist Office. 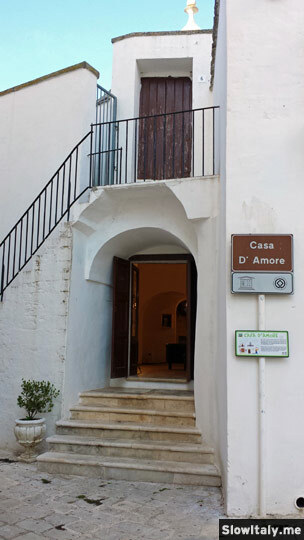 Casa d’Amore. Photo © Slow Italy. 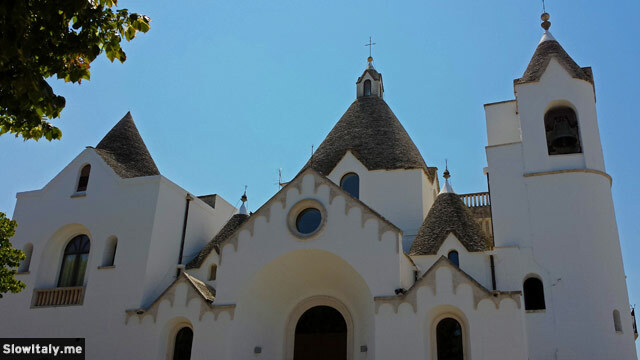 Built in 1926, the Romanesque’s church main vault consists of a 25 meter high trullo. 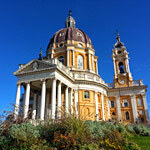 Belvedere: located off Piazza del Popolo, the Belvedere offers a panoramic view over the Rione Monti. 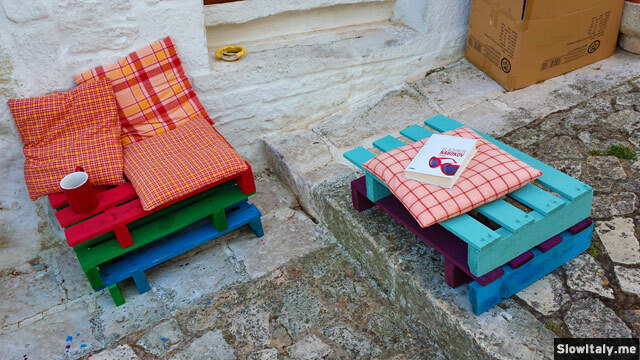 Part of this trip, which started with Matera, Basilicata, consisted in sleeping in authentic dwellings. 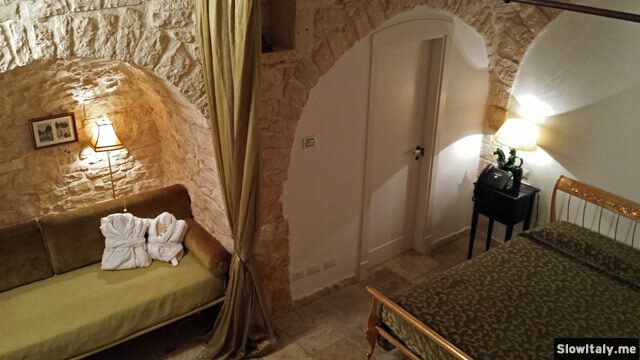 So, our choice in Alberobello was to sleep in an authentic trullo, part of a beautifully renovated hotel. 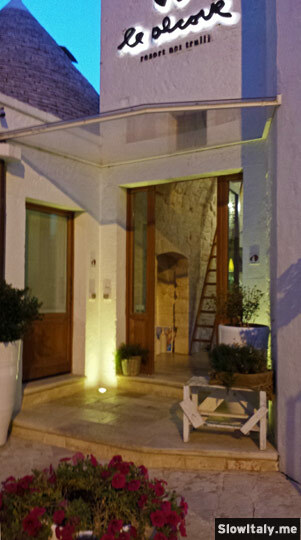 Hotel Le Alcove, an authentic trullo hotel is located in the Rione Aia Piccola, close to the main square, to the Case d’Amore, the main shopping street and restaurants. Our room was a little gem, very comfortable and complete with the conical roof! 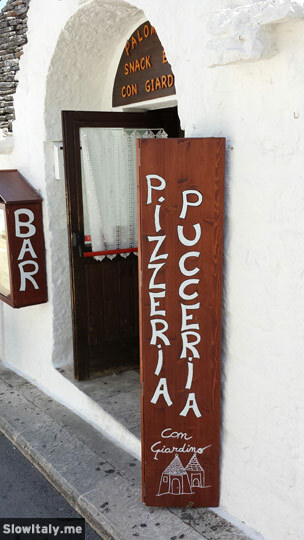 Typical Apulian dishes and delicious single dishes (piatti unici) such as the tagliere misto di salumi e formaggi, good for lunch or a light evening meal. We couldn’t resist and had already eaten half of the cheese plate before I took the photo! 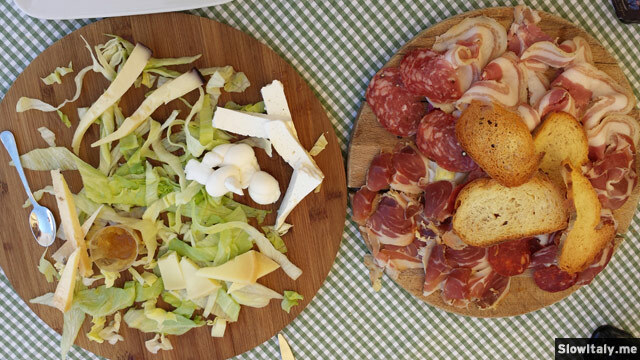 All antipasti and secondi are beautifully served. We couldn’t try them all, but they truly seemed delicious. 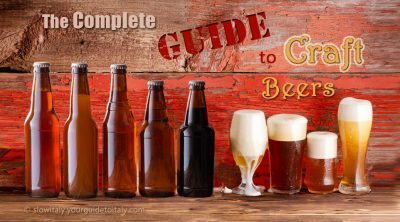 You can also try artisan beers from the Puglia region such as Beva, Negramara extra and Abboccata and they have a choice of imported artisan beers, as well. 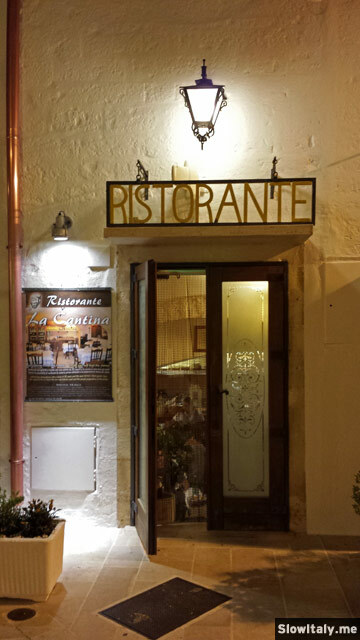 The restaurant is located on Piazza del Popolo, the main square of Alberobello, but outside the hectic of the touristy quarter. The nice, fresh terrace overlooking the relatively quiet main square is definitely a plus. 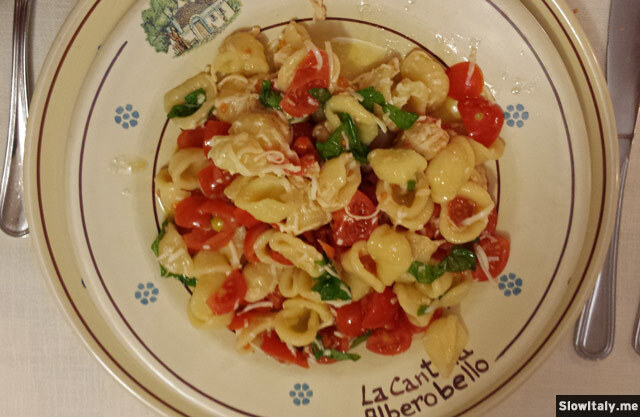 Try the Orecchiette o Fricelli al ragù, Cavatelli integrali con cime di rapa, Fricelli con zafferano e capocollo di maiale or Taglioline con funghi e castagne. 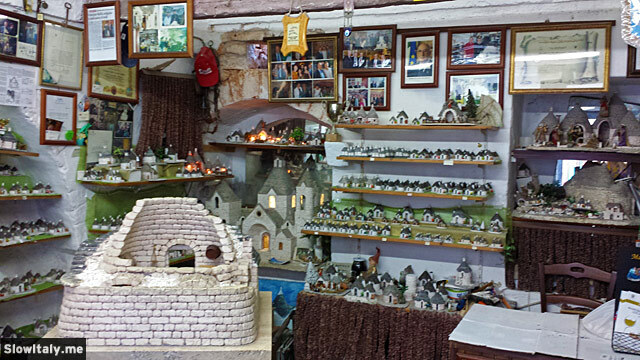 The (authentic) miniature trulli of Alberobello are true works of art that are executed with the same technique and care, used by the maestri trullari for the real-size trulli. 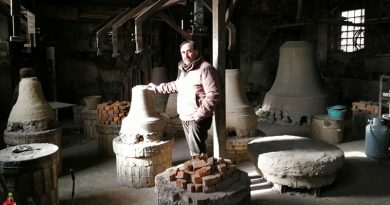 If you’d like to support local artisans and are looking for a true piece of local arte povera have a look at Giuseppe’s atelier.